Whilst safety in the kitchen is paramount, being too cautious and overprotective can turn even the homeliest of kitchens into a fun-free zone for children. Too many rules are a turn-off for even the most curious kid; not enough rules and you run the risk of regular trips to A&E. 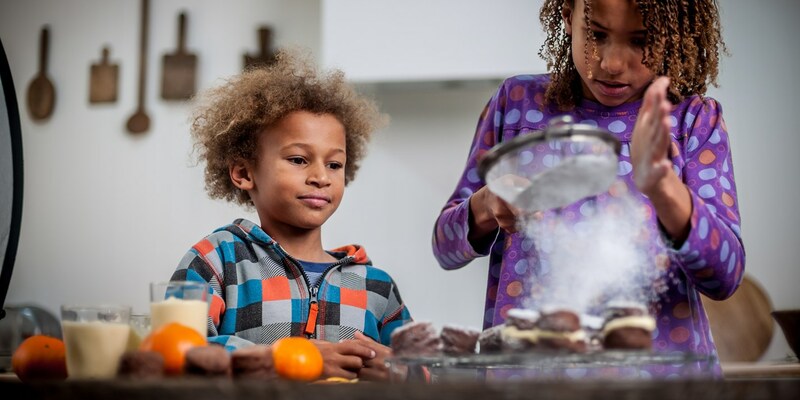 Whilst safety in the kitchen is paramount, being too cautious and overprotective can turn even the homeliest of kitchens into a fun-free zone for children. Too many rules are a turn-off for even the most curious kid; not enough rules and you run the risk of regular trips to A&E. Here are some tips that will keep both parents and kids safe, interested and happy. • Warn: the cooker is hot! Leave that cord alone! Don’t eat cat food! You know the drill. • Supervise: especially if they’re standing on a chair to help, and when they’re around ovens, hobs and sharp objects. • Observe: kids are capable creatures who learn more quickly if we take a step back. • Trust: left to their own devices, kids aren’t always naughty or clumsy. • Answer: kids are the reason Google was invented. There’ll be many questions, and you must reply to each one. • Praise: for washing their hands. For helping to spread the butter. For tidying up afterwards. Good for them! • Give regular reminders about what’s not ok to touch. There’s the obvious: sharp objects, hot things. Then there’s your piece of cake they’ve got their eye on. • Reiterate from an early age that cookers, kettles and hobs are hot. Keep reiterating. • Move pots and pans to the back of the hob, with handles turned inwards. • Be aware of dangling appliance cords that small hands can (and will) grab. • Keep knives, scissors, matches, cooker lighters and electrical equipment such as food processors out of reach. Graters and vegetable peelers can also be very sharp. • Avoid having small fridge magnets until kids are older. • Teach food hygiene, mainly washing hands and rinsing vegetables. Older kids can be taught more complex safety, such as keeping raw meat separate from cooked meat. • Lock away cleaning products, medicines and vitamins. • Keep alcohol on a high shelf; this not only prevents children from drinking it, it acts as deterrent for harassed parents. • Lead by example: follow food safety guidelines such as thawing food properly. • Exercise patience: they’re new to this and will be for some time. • Find the time: if you’re rushing you’re more likely to have accidents. • Wash their hands: the sooner they learn to do this, the better. • Wear an apron: aprons catch a lot of the mess. • Listen to instruction: if they won’t try cooking another time. • Tick off a recipe: they’ll learn to follow steps and gain a sense of achievement. • Lick the bowl: it’s an integral part of growing up. • Small, safe utensils: whisks, wooden spoons and pastry brushes are a good start. As they become more au fait in the kitchen, upgrade the equipment. • Blunt knives such as butter knives: to save fingers. • Plastic bowls and cups: to save your best crockery.